This post is supposed to be about Shuna’s to-die-for caramel cake and the caramels are the optional challenge. I managed to finish the caramels but just ran out of time to make the cake. I’m very disappointed to miss a challenge, but I plan to make the cake for my birthday in January. I just can’t pass that one up! My love for caramel began as a child, a love that comes directly from my mother. I remember the blocks of Kraft Caramel that she would bring home from the grocery store, and she would cut off thin slices for us as a treat. Chocolate is delicious, but caramel has always occupied the top spot of my sweets list. Given a choice, I’d rather have gourmet caramel than gourmet chocolate, and I have the firm opinion that gourmet caramel makes gourmet chocolate taste even better. 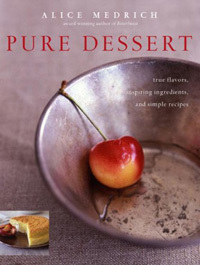 Alice Medrich is a queen of chocolate and dessert, and she has published a number of books on the subject. This particular caramel recipe comes from her book Pure Dessert, and she offers several variations such as making fleur de sel caramels or adding cardamom or nutmeg. These are so creamy and delicious and they would make wonderful holiday gifts. This is also the base recipe for a decadent caramel sauce (see Variations below). The recipe calls for two special ingredients: ground vanilla beans and golden syrup. The ground vanilla beans are exactly what they sound like, but I substituted a whole vanilla bean because trying to grind a vanilla bean didn’t work so well for me. If you purchase ground vanilla beans, make sure it’s made with virgin vanilla beans rather than beans that have been previously used because you will get so much more flavor. I have not seen it in any of our nearby stores, but it is available from a variety of online retailers (see Resources below). The golden syrup makes this recipe stand out from many caramel recipes I’ve seen which call for plain corn syrup. What’s the difference? Golden syrup is an inverted sugar syrup, a by-product of processing sugar cane into sugar. (Trivia: Inverted sugar syrups are used for making some popular sweets and Jones Soda uses inverted cane sugar to sweeten their soft drinks.) It has a golden amber color and a fuller flavor profile than corn syrup, which is pretty much tasteless. In my area I was able to find King Syrup, which is actually a combination of corn syrup and golden syrup, so not exactly true golden syrup but close enough. You might find Lyle’s, a well-known brand from the UK in your area, though it’s rather spendy here in the United States. If you cannot find golden syrup, regular corn syrup will work or you can order golden syrup online (see Resources below). My experience with making the caramels started with me spilling an entire cup of that sticky golden syrup onto the counter, down the cabinets, and and onto the tile floor. Michael decided to make a quick exit from the kitchen at that point. The rest of the experience was good, and I was moving uber slowly to make sure I didn’t have any further mishaps. The aroma of this cooking caramel is sinful and the color is a deep golden brown. I went for the slightly higher temperature at the end and had hard but chewy caramels, which were also a challenge to cut cleanly. Though I had a lot of shards when cutting, they didn’t go to waste; I saved them for melting in my coffee. If you’ve never made candy, you’ll want to make sure you have the right equipment before starting. 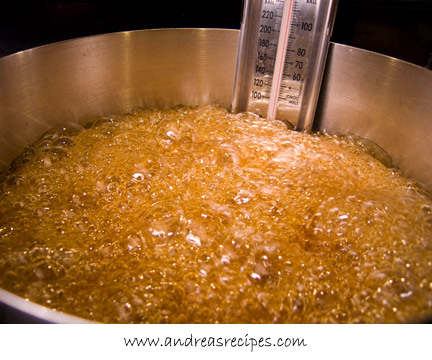 A candy thermometer is a must, as well as a heavy pan with tall sides, and both can be used for making many types of candy, including my mother’s peanut brittle. When you get to the step of adding the butter and cream and you watch the mixture bloom up the sides of the pan and threaten to boil over, you’ll be glad you had that tall pan. Thanks to Dolores of Culinary Curiosity, Brownie of Blondie and Brownie, Jenny of Foray Into Food, and Natalie of Gluten A Go Go for hosting this month and for choosing to feature caramel in our challenge. Thanks also to Shuna for being a special advisor to everyone while we (uh, everyone else) tackled her cake. I can’t wait to make it for my birthday! To see all of the delicious caramel cakes and caramels, visit The Daring Bakers Blogroll and the Daring Bakers Gallery on Foodgawker. Adapted from Pure Dessert, by Alice Medrich. 1. In the sauce pan, cook the golden syrup, sugar, and salt over medium heat, stirring with a silicone spatula or wooden spoon, until the mixture begins to simmer around the edges. Dip the pastry brush in water and wash the sugar and syrup from the sides of the pan to keep a crust from forming. Cover and continue cooking for about 3 minutes. Uncover the pan and wash down the sides once more. Clean the crusty bits off the spatula/spoon before using again. 2. Attach the candy thermometer to the pan, but don’t let it touch the bottom of the pan (important so you get an accurate temperature). Cook, uncovered (without stirring) until the mixture reaches 305° F/152° C.
3. While the syrup mixture cooks, combine the cream and ground vanilla beans/whole split vanilla bean (not the extract) in a small saucepan and heat until tiny bubbles form around the edges of the pan. Turn off the heat and cover the pan to keep the cream hot. 4. When the sugar mixture reaches 305° F/152° C, turn off the heat and stir in the butter chunks. Gradually stir in the hot cream; it will bubble up and steam dramatically, so be careful. Go slowly. I just drizzle in a little cream at a time until the temperature stabilizes. Turn the burner back on and adjust it so that the mixture boils energetically but not violently. Stir until any thickened syrup at the bottom of the pan is dissolved and the mixture is smooth. 5. Continue to cook, stirring occasionally, until the temperature reaches 245° F/118° C. Then cook, stirring constantly, to 260° F/128° C for soft, chewy caramels or 265°F/130° C; for firmer chewy caramels. The soft caramels will be easier to cut, the firm caramels will be closer to a toffee consistency. 6. Remove the pan from the heat and stir in the vanilla extract (only if you did not use the ground vanilla/vanilla bean). Pour the caramel into the lined pan. Let set for 4 to 5 hours, or overnight until firm. 7. Lift the pan liner from the pan and invert the sheet of caramel onto a sheet of parchment paper placed on a cutting board. Peel off the foil. Cut the caramels with an oiled knife. (I poured a little canola oil into a bowl, dipped a paper towel in it, then rubbed it on the knife.) 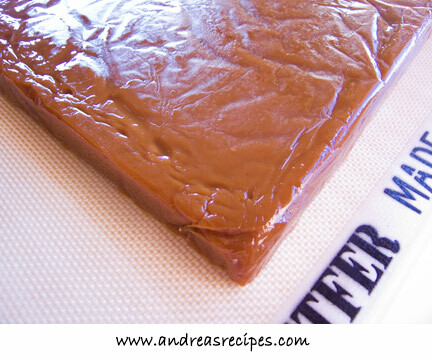 Wrap each caramel individually in wax paper or cellophane. 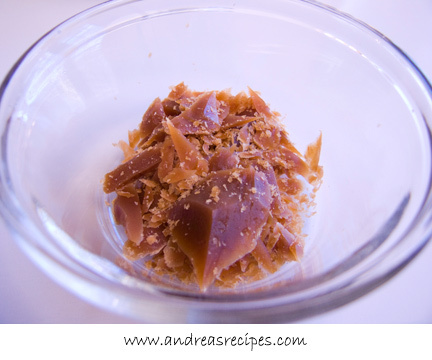 Fleur de Sel Caramels: Use extra salt, in the form of fleur de sel or another coarse flaked salt, to bring brings out the flavor of the caramel. Add an extra scant 1/4 teaspoon of coarse sea salt to the recipe. Or, to keep the salt crunchy, let the caramel cool and firm. Then sprinkle with two pinches of flaky salt and press it in. Invert, remove the pan liner, sprinkle with more salt. Then cut and wrap the caramels in wax paper or cellophane. Caramel Sauce: Stop cooking any caramel recipe or variation when it reaches 225° F/105° C or, for a sauce that thickens like hot fudge over ice cream, 228°F/110° C. Pour it into a sauceboat to serve or into a heatproof jar for storage. The sauce can be stored in the refrigerator for ages and reheated gently in the microwave or a saucepan just until hot and flowing before use. You can stir in rum or brandy to taste. If the sauce is too thick or stiff to serve over ice cream, it can always be thinned with a little water or cream. Or, if you like a sauce that thickens more over ice cream, simmer it for a few minutes longer. Beautiful work Andrea. Im tempted to do these caramels. I just did the cake. Lovely caramels! I had the most fun making these. I let the final temperature reach about 263 degrees, so mine came out soft and chewy. I also used my heavy 3-quart enamel-coated cast iron pan, which was just right. Thanks for the resources on the ground vanilla. Looks great … yummy yummy :-)!!! I also did the cake but I definitely want to try these too now 🙂 …. Compliments!! Those caramels look so good Andrea. You should try the cake sometime. It really was delicious! Lol! I only had time to make the cake, but I was dying to try those caramels. They look divine! I’m a total caramel junkie too. I’ve got to make some! Great looking caramels. Hope you enjoy the cake in January! Your caramels look wonderful. Can’t wait to see the cake. I hope you don’t mind me chuckling about your spilled syrup as I had a similar incident with the caramel syrup. I didn’t make the caramels, just the cake, but I’m so tempted, seeing how good these look. Thanks for baking with us (or making candy with us) this month. Andrea, you caramels look so good! 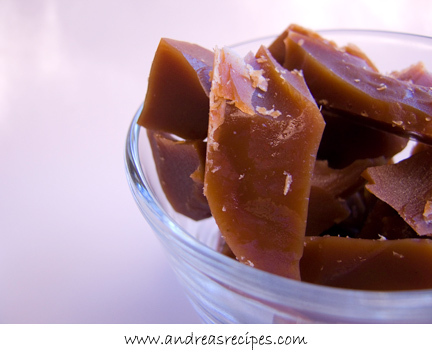 I’ve never thought about making my own caramels before, they would make great Christmas presents. You make me want to try them, yours look wonderful. You will like the cake – it is actually not that difficult – compared to the last couple we have done. 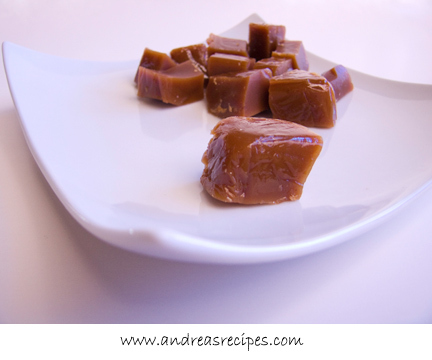 I wish I had been able to make the caramels because like you, I have been in love with caramel since I was very young. I’ll definitely try making them for Christmas though! I had to laugh reading about you spilling the golden syrup because that sounds exactly like something I would do! Seriously! i did not do these – i will though for my christmas goodie bags! make this – it was incredible! Like you, I ran out of time — too much going on! But you have me thinking of those caramel shards melting in coffee so know I’ll probably make these before Christmas. I’m with you on the “favorite” aspect of caramel. I love it. Ooooh, pretty! I forgot my candy thermometer at home, so this one has to wait, but I imagine I’ll be making a batch for some christmas gifts. Lovely work. Fantastic recipe. Flavored sea salts such as—- Vanilla, Caramel, or Almond Cardamom—- would also be a lovely accent to your caramels. All three are carried by Secret Stash Sea Salts. I made the cake but not the caramels! but I really do want to try them – yours look great! Oh my that looks good…. And I’m with you – I like chocolate but I love caramel! Ohhhh, this looks so good you are tempting me to consider even trying this. I own a candy thermometer, but only so I can make yogurt — I’ve been too afraid to attempt to make candy. But I adore caramel — when I was pregnant with #1 it was one of the few things that helped me with my morning sickness for some reason. In the grand scheme of things, would you rate this as a good way for someone to enter the candy making end of cooking? I’m always afraid of scalding it or setting it on fire or… well, I don’t know what exactly. It just seems more daunting than “regular” cooking. Then again, I guess yogurt making seemed daunting at first (I think I was afraid I’d kill us all somehow with some horrible bacterial infection). Perhaps like all cooking, it’s more a matter of being willing to throw it out if you really screw it up?